One of my friends decided to “help” with the pages this week, and I just had to share. Enjoy this short little comic by Will, lol. Due to back-to-back events, and one of my dogs being deathly sick (we just got her back today from the vet and she’s finally doing better, but we still know not what’s wrong with her), things are too stressful, and I’m just going to take ZK off for the week to get myself back in order. I know, just in time for the end of the chapter (sorry!). This should be the last time I need off for the year though, and for sure updates will resume next week as normalish. I’ll be at Youmacon this weekend, so if you’re there, stop by my booth at C18, in the Artist Alley. You can harass me about ZK’s skipped weeks there, lol. 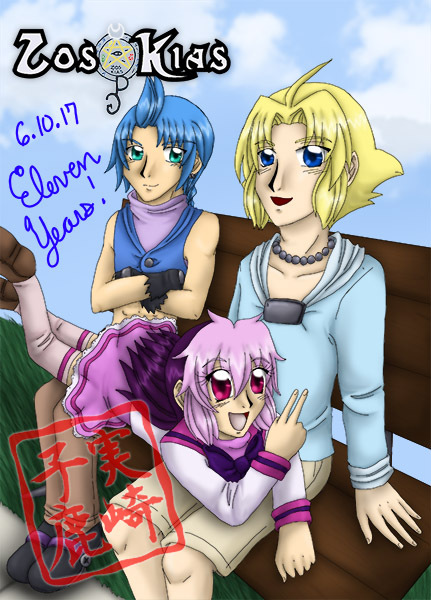 So, have an art for the anniversary! This week we have a guest artist…sorta XD I asked people to draw me bad scenery! So, Kallik’s art is done by FidyYuan, thanks so much for the picture. It is so beautiful!